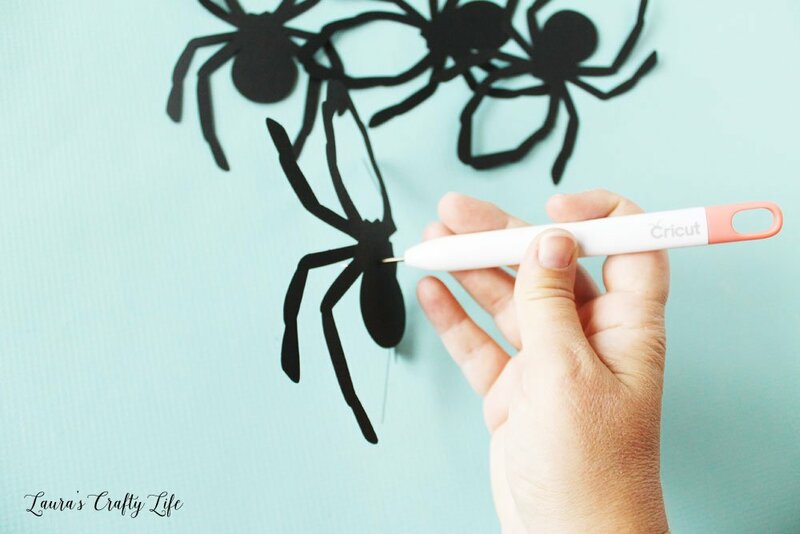 Spider Halloween Party with Cricut Maker. 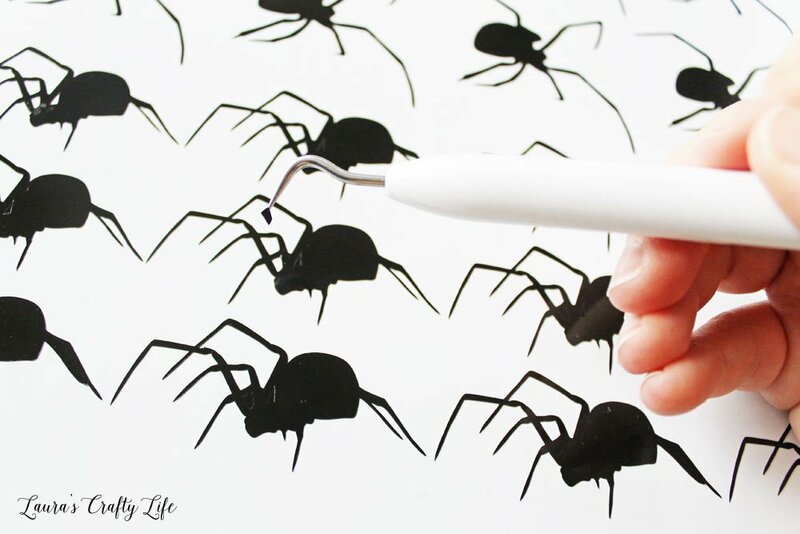 Create everything you need for a creepy spider party using your Cricut Maker and the adaptive tool set. 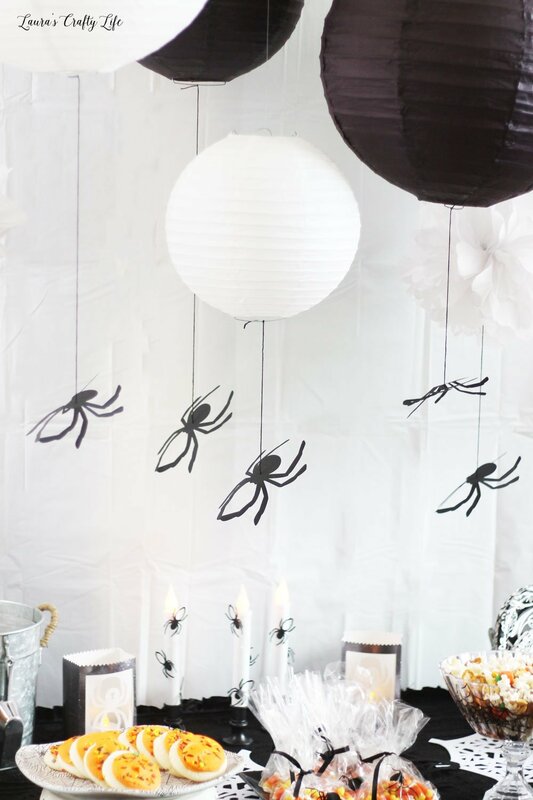 Ideas for a spider table runner, spider cups, spider treat bags, hanging spider decor, spider luminaries, and spider candles. You all know I love to throw themed parties! 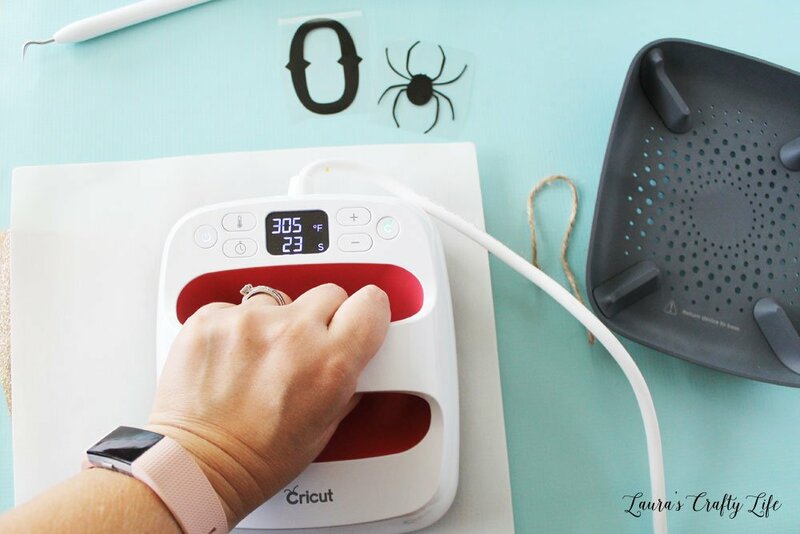 I haven’t been able to do many parties lately, so when I had the chance to work with Cricut to create a spider-themed Halloween party, I jumped at the chance. This post contains affiliate links. If you purchase something through the link, I may receive a small commission at no extra charge to you. Please read my full disclosure policy here. 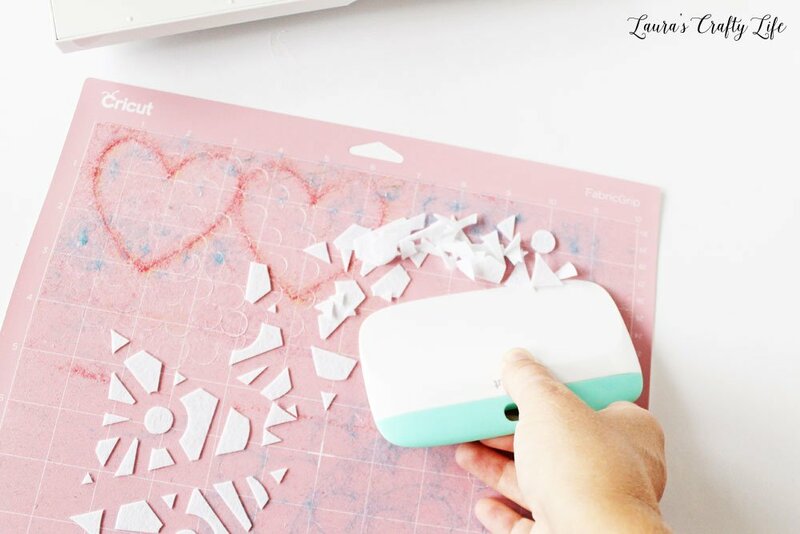 Thank you to Cricut for sponsoring this post and providing me with some of the products in this post. You can find many party supplies online and in stores, but sometimes you want something specific. Or you are trying to save money by using craft supplies you already have at home – like cardstock, iron-on, and vinyl. 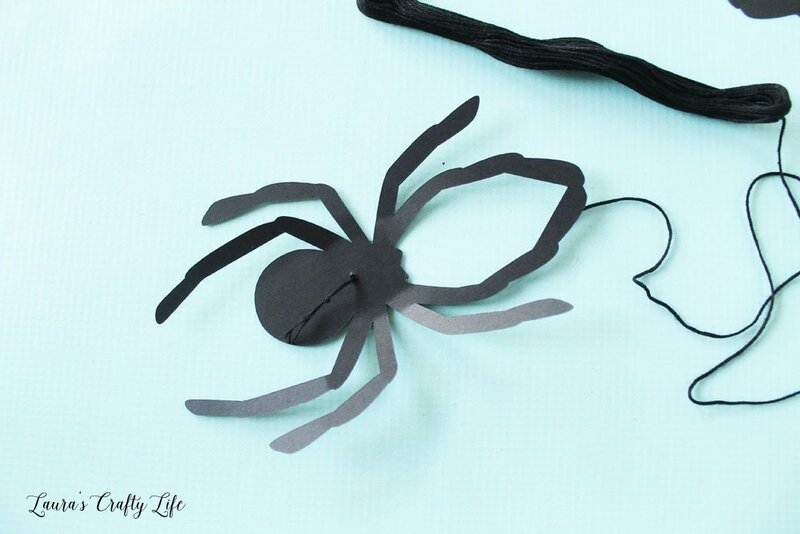 I used all of these materials, plus vellum, sparkle paper, and felt to create this entire Spider Halloween Party with my Cricut Maker. 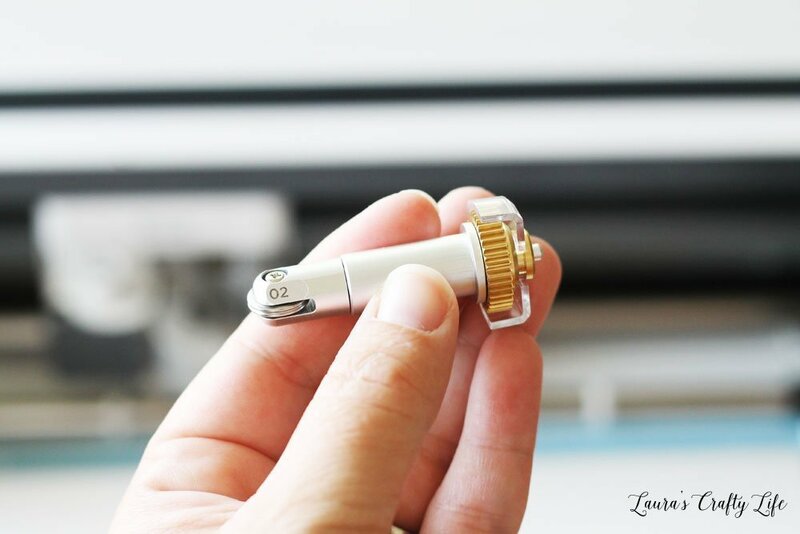 The new adaptive tool system makes the Maker the most versatile Cricut machine. 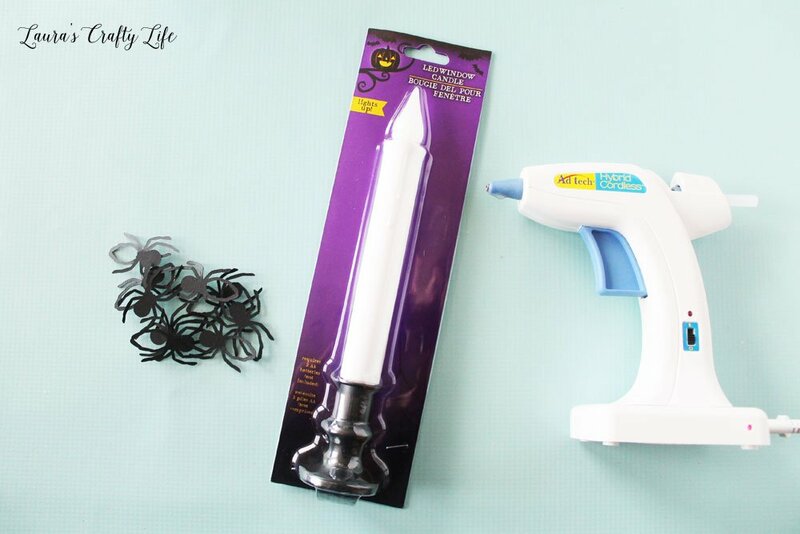 I used the rotary blade, scoring wheel, and fine point blade to create these SEVEN DIY Halloween crafts for my party! I wrote a mini-tutorial for each of the projects for this party. 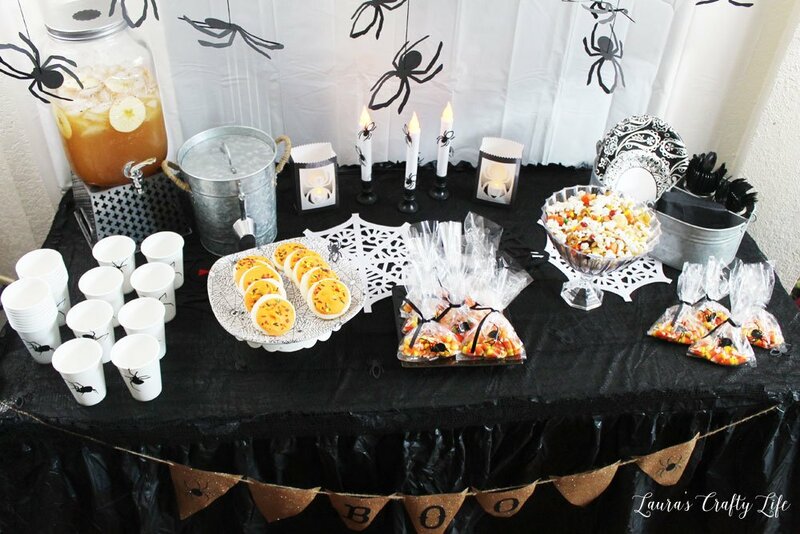 Grab yourself a snack, a cup of hot apple cider, and let’s get started on making a spooktacular spider Halloween party! I started by creating a fun felt spider table runner. You can use any type of felt with the Cricut Maker and rotary blade, but I have found the Cricut felt sheets to be the best for not leaving lint behind on the mat. I created a design in Cricut Design Space for two different large spider webs. Open the Design Space file and click the green Make It button. When you get to the mat preview choose 2 project copies, click Apply. Select Continue. 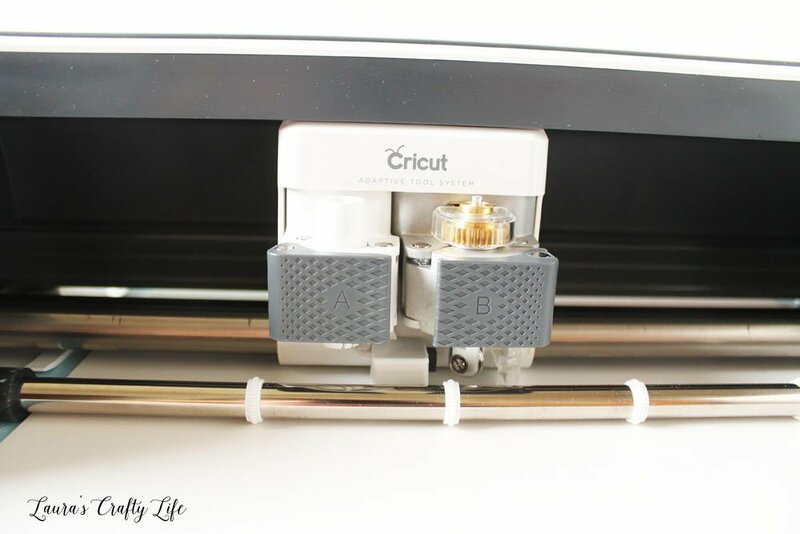 Choose your Cricut Maker from the cut screen. Choose Felt from the materials list. Select Edit Tools so you can choose the Rotary Blade. Cut out all your felt using the Cricut Maker. When you are finished, you will have two white spider webs, two black spider webs, and two small red circles. The felt spider web pulls right off the mat really easily, but you are left with a bunch of small felt pieces on the mat. You can use an XL scraper to quickly clean your mat. This works well for cardstock, as well. 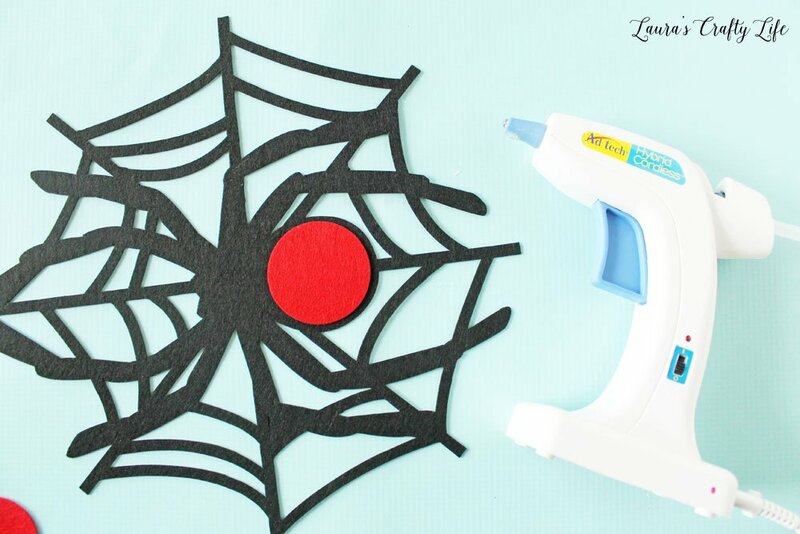 Use hot glue to attach the red circles behind the hourglass cut out on the black spider web pieces. Then, use hot glue to attach the black spider webs to the white spider webs in a row, alternating colors. I am so amazed by how well the Maker can cut such intricate cuts so cleanly and precisely. A fun way to easily carry your theme throughout a party is to decorate the cups or water bottles. I have done this in the past with duct tape or water bottle wraps. I have used stickers, as well. I wanted big, creepy spiders on the cups but large stickers can be hard to find. 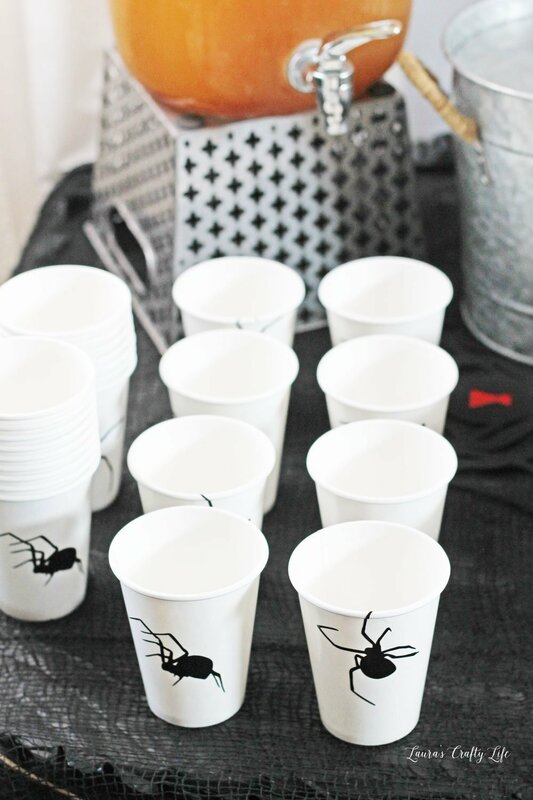 I used the Cricut Premium glossy vinyl to add these spiders to my cups. 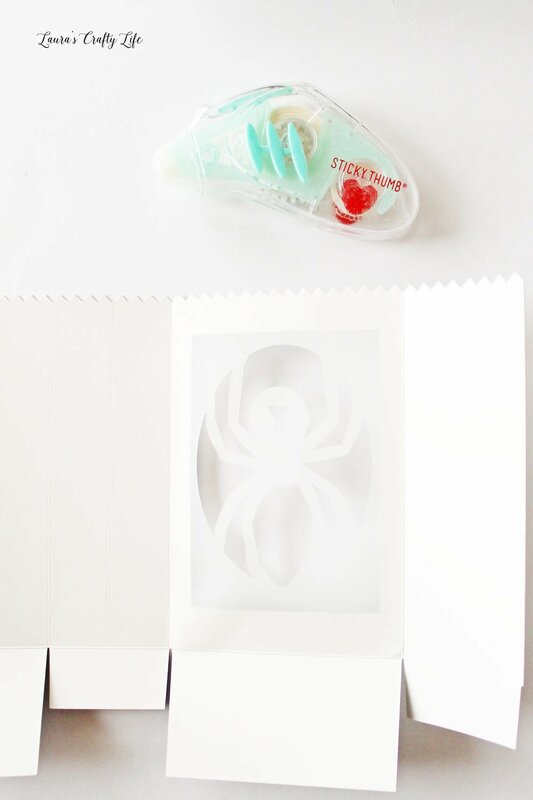 I found a couple of creepy spiders in Cricut Design Space. I sized them so they would be the best size for my small paper cups. You can easily add these to clear plastic cups, or even glasses if you want because the vinyl is permanent. Open the spider cups file and click Make It. Select 12 project copies and click Apply on the mat preview page. I had 24 cups, so I cut 12 of each spider. Then, click Continue. On the cut screen, select Premium Vinyl from the materials list. Cut out all the spiders. Weed the excess vinyl while the liner is still on your cutting mat. Use your weeding tool to help get all the little pieces out from around the spider’s legs. 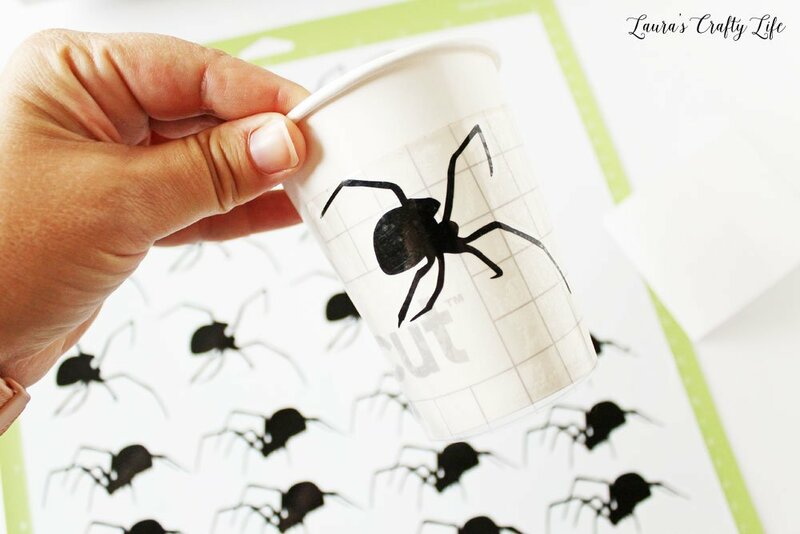 Use a small piece of transfer tape to move one spider at a time to each cup. 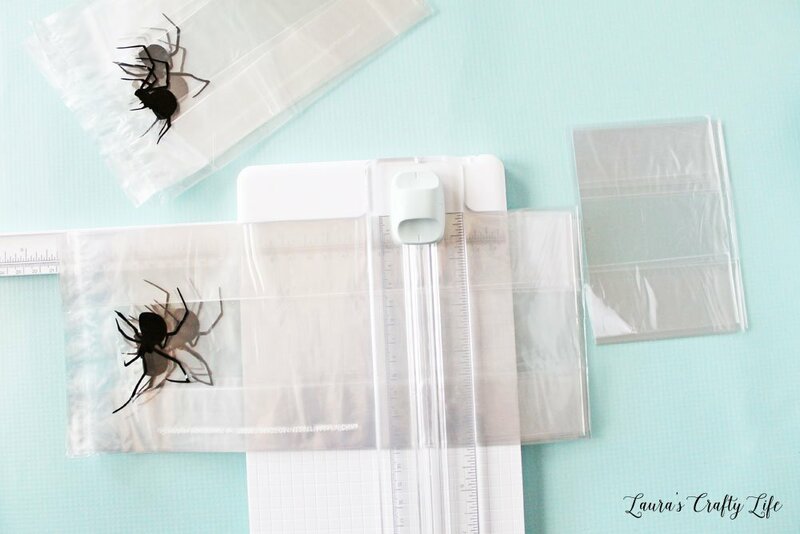 I was able to re-use the same piece of transfer tape for about 12 spiders before I needed a new one. I altered the placement of the spiders on each cup. I even made a few of them look like the spider was crawling into the cup. 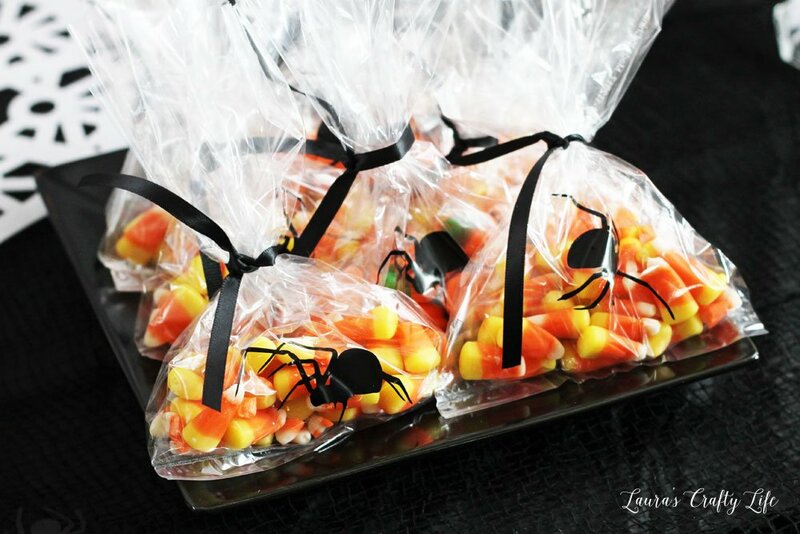 I used the same spider design as I did for the cups to create some little treat bags. I cut out the spiders from the same permanent vinyl. 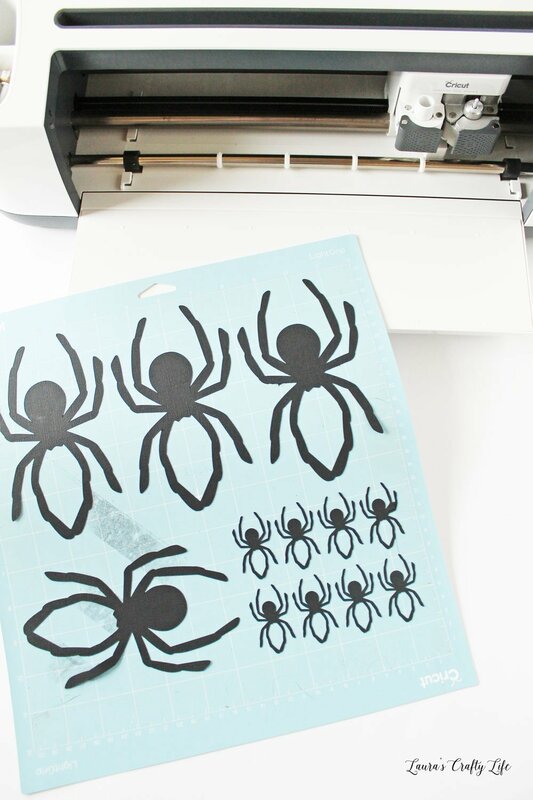 Instead of using transfer tape for the bags, I simply pulled the spiders off the paper backing after weeding out any of the small pieces from the legs. Once I had the spiders on the bags, I trimmed them so they were not quite so tall using my paper trimmer. I filled the bags with candy and then tied a ribbon around each one. 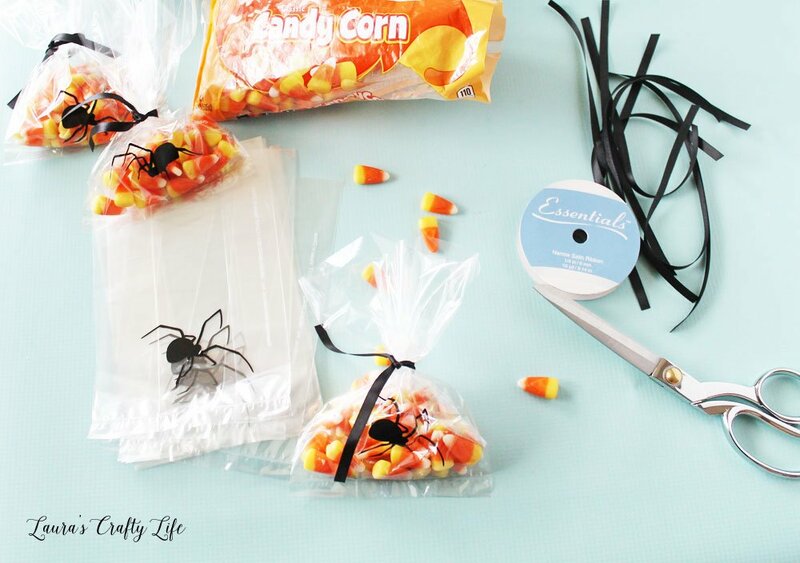 These simple treat bags are the perfect little treat for each guest to take home after the party. The next project I created to go on my table was a spider luminary. 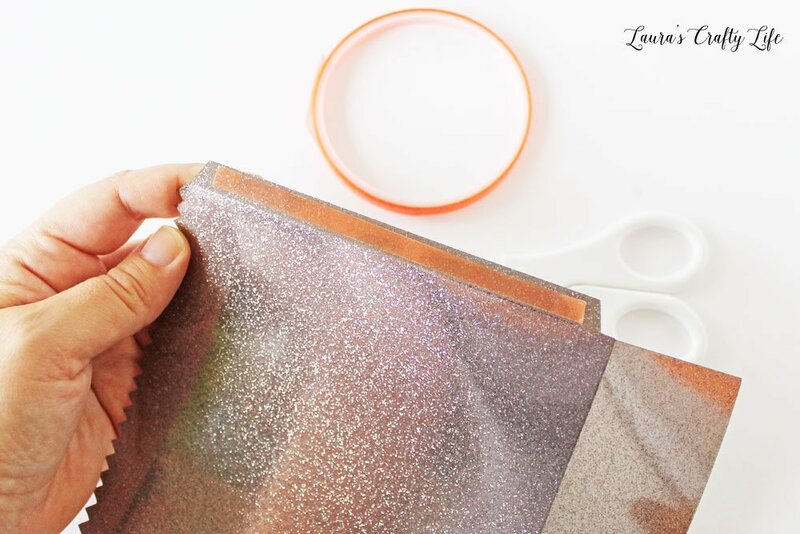 The sparkle paper is the perfect glittery material to create a luminary. If you search “luminary” in Cricut Design Space, a ton of great designs automatically pops up. 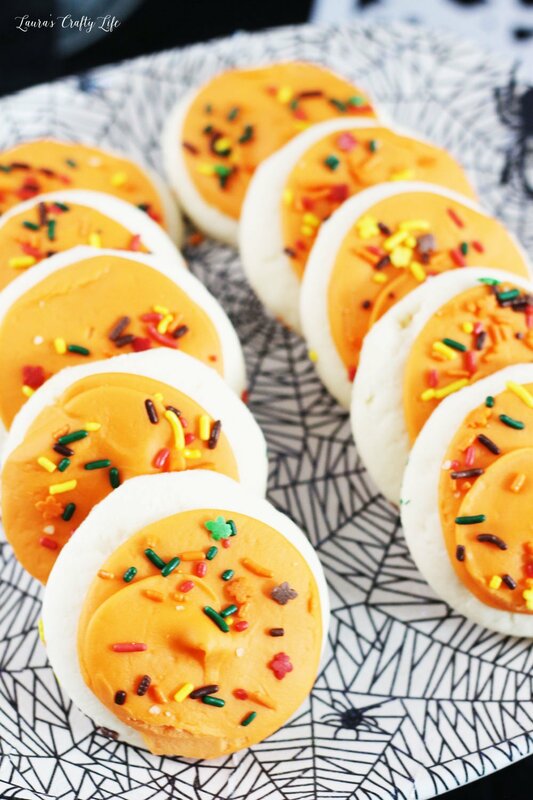 They are pre-made to simply be scored and cut. 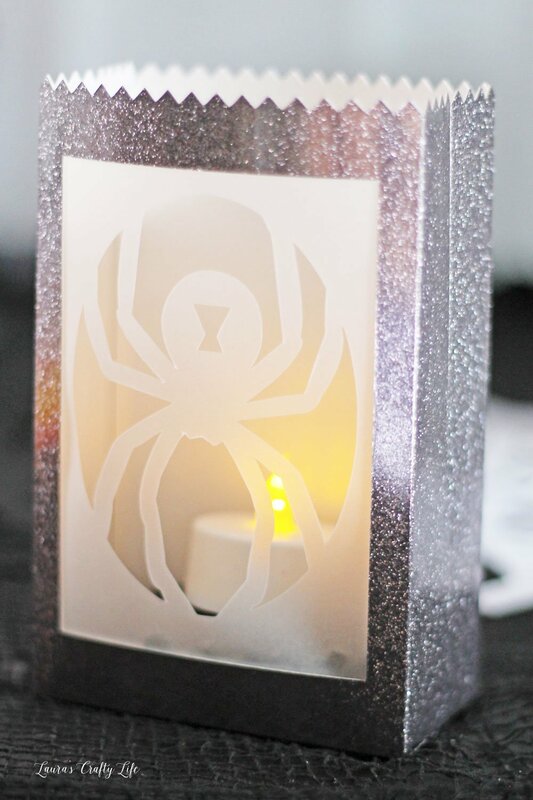 Since I was going for a spider theme at this party, I found the perfect spider luminary design to use. I made it as large as I could to use the most of one sheet of paper. Be sure to select Sparkle Paper from the materials list. It will show you that you need the double scoring wheel. Make sure the tip on your scoring wheel shows the .02. Load your sparkle paper onto your mat, sparkle side down. 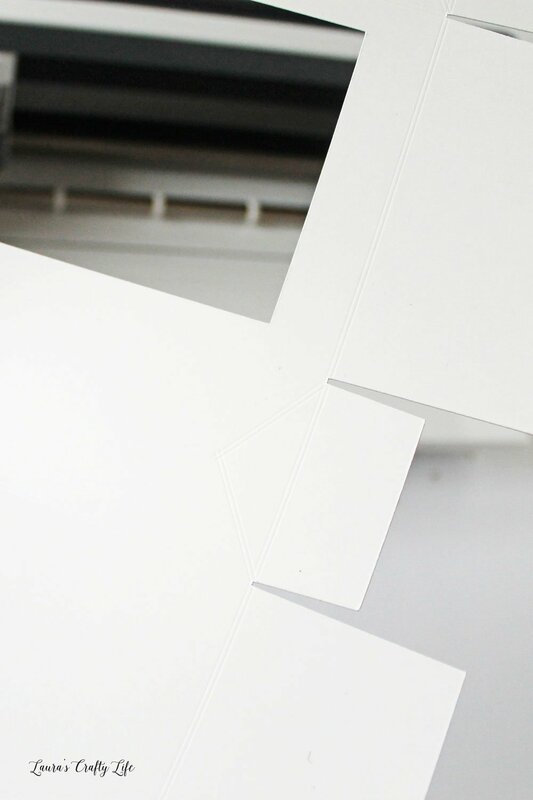 The machine will create the score lines on the backside of the paper. Then it will prompt you on the screen to use the fine point blade. Change the blade and cut out the vellum. 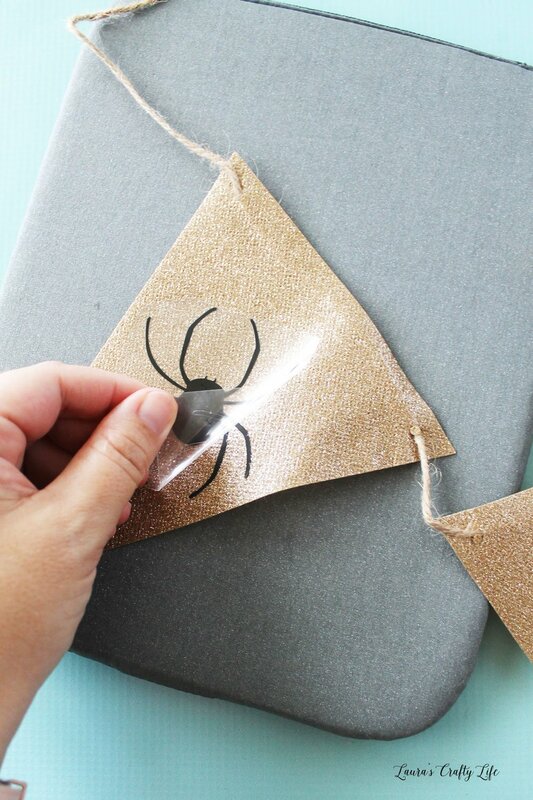 Make sure you change the materials setting to Vellum before cutting out the spiders. Adhere the vellum to the inside of the luminary. Fold the luminary on all the score lines. The double score lines allow you to fold the sparkle paper without any cracking. Assemble the luminary. 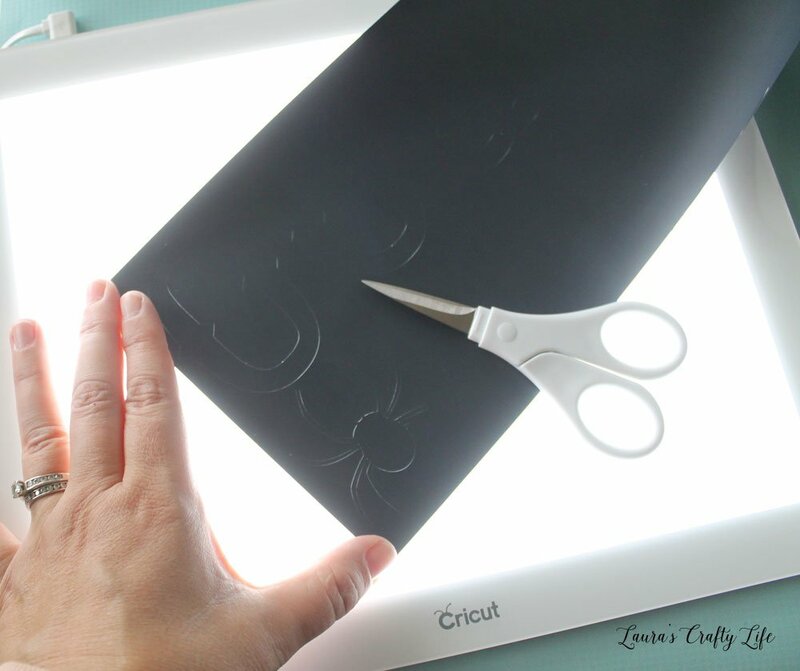 Use a strong adhesive like red tape so you can make sure the luminary stays together. Since the sparkle paper has a very smooth, shiny surface, regular double-sided adhesive won’t work. The sparkle paper is so fun. It looks even better in person. Add some sand or small rocks to the bottom, a small LED tea light, and your spider luminary is ready to shine. 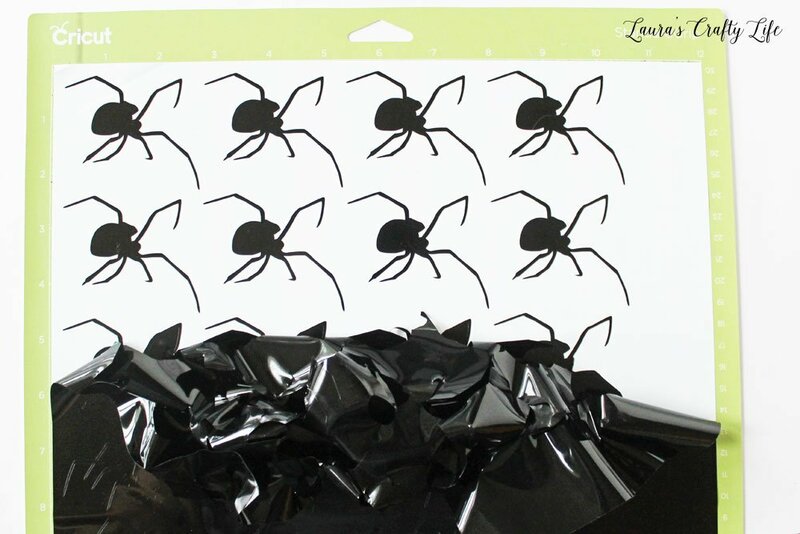 For the next couple of projects, I needed some large and small cardstock spiders to use on my candles, on the table, and to hang from the paper lanterns. I wanted 8 of the large spiders. 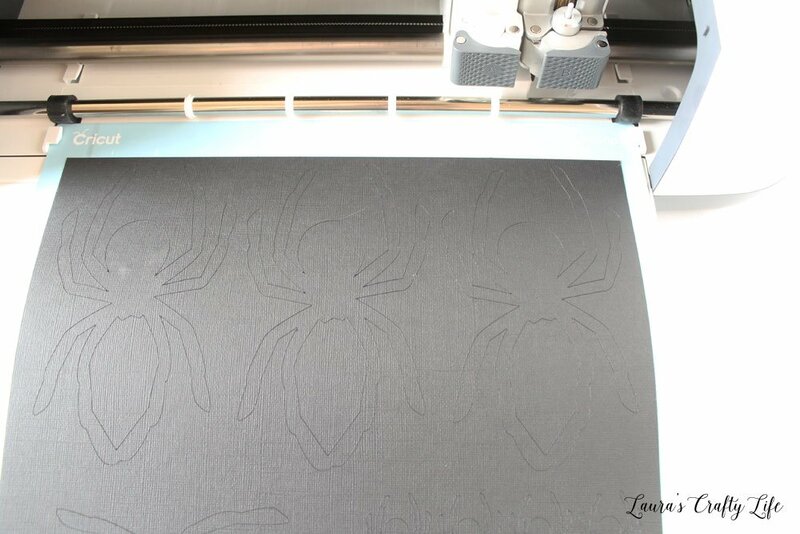 However, when I added in the small spiders it was going to cut everything out on three mats, instead of just two. To get the most out of my cardstock, I added one set of the large spiders, plus a bunch of smaller spiders to the canvas. I selected all the images and clicked Attach. This tells the machine to cut these all as one group of images and will not relocate them on the mat. 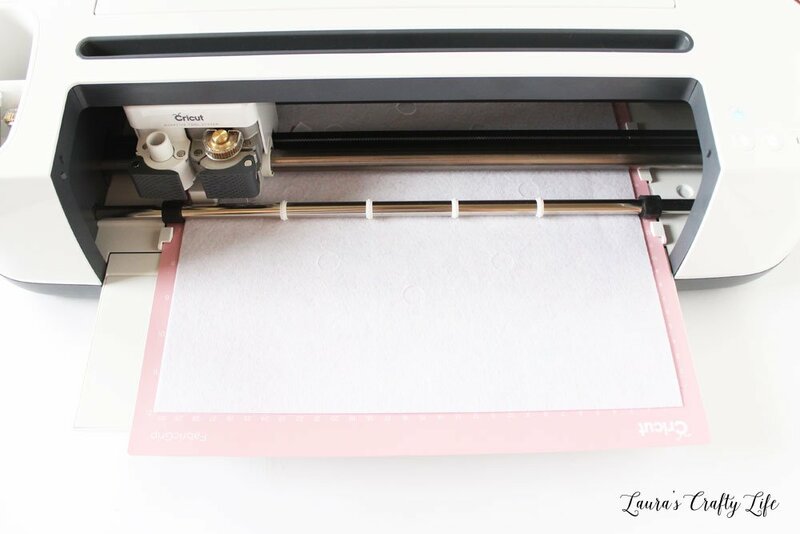 Most of the time the Cricut does a great job of conserving paper, but this is an easy way to fix it if it does not. Open the Hanging Spiders file and click the green Make It button. On the mat preview page, select 2 project copies and click Apply. Then, click Continue. 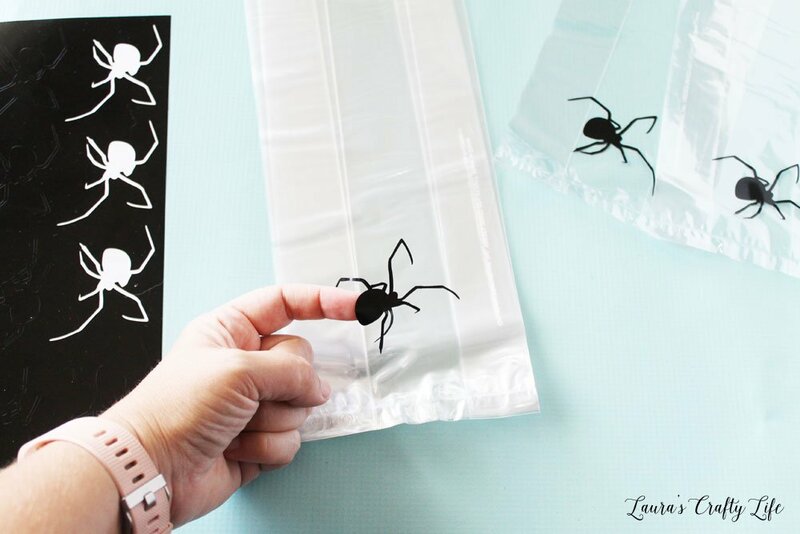 On the materials list, select Cardstock and cut out your spiders. 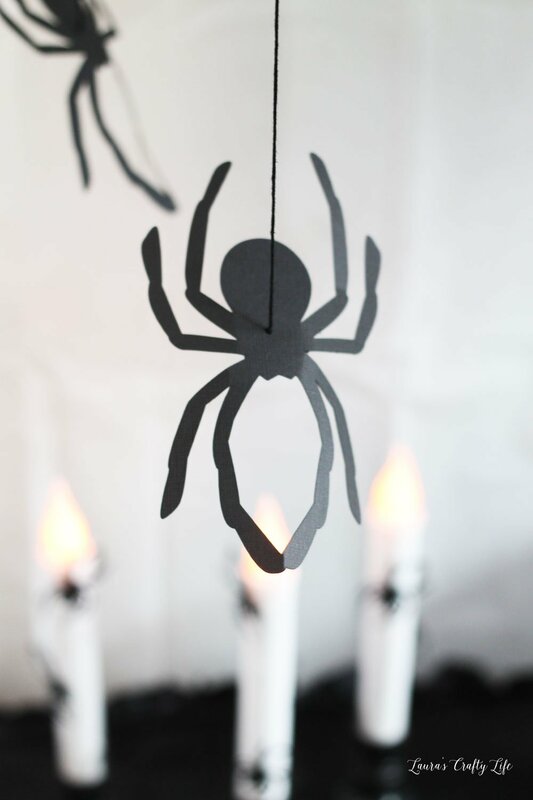 To hang the spiders from my paper lanterns, I used some black embroidery floss. Poke a hole in the spider using the piercer tool. Thread the embroidery floss through the hole and tie several knots in the back so the floss will not slide back through. Tie the hanging spider to the lanterns. You could also hang the spiders from helium balloons as well! They add a really cool dimension to the party scene. 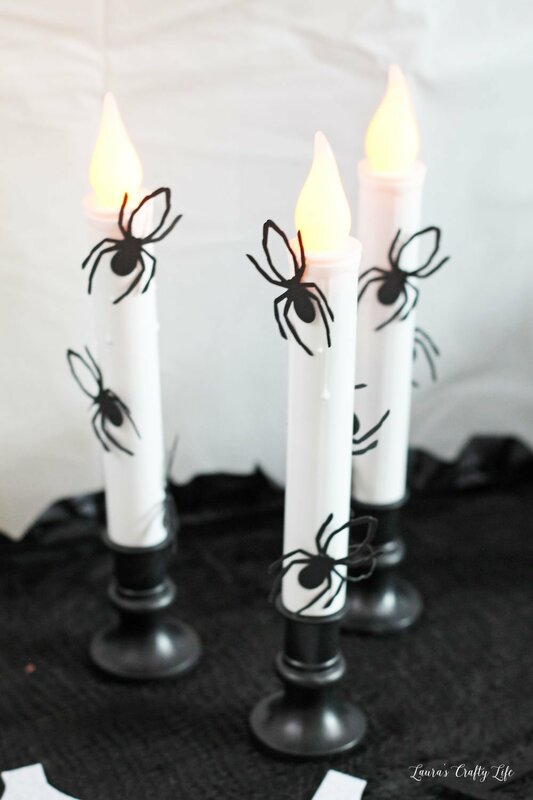 I used some of the small spiders I cut out when making the hanging spiders on these LED candles I found at Dollar Tree. Once they were cut out with the Maker, I simply hot glued them onto the candle. Since they are LEDs, I am not worried about having the paper spiders on there. And I left the glue gun strings. They look a little like spider webs! The final project I created for this party was adding some iron-on details to a pre-bought banner. The Target Dollar Spot always has great blank banners you can use for projects. I found a sparkly gold pennant banner that I wanted to use. 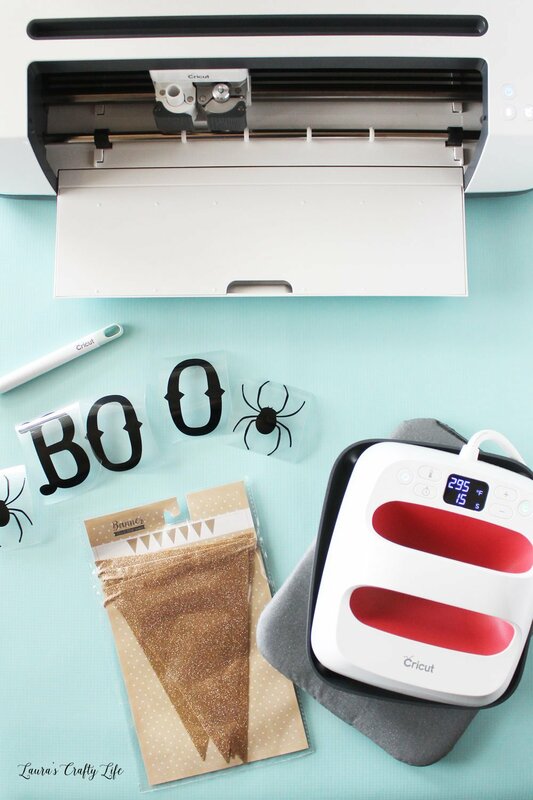 I created the word BOO and two spiders to use on my banner in Cricut Design Space. Open the Boo Banner file. Click the green Make It button. Make sure to select Mirror your image any time you are using iron-on. Select Everyday Iron-on from the materials list, load your iron-on to the mat, shiny side down, and cut out your pieces. I love to use the Bright Pad to help me see what I am doing when I need to weed iron-on. I needed to cut each letter and spider apart for the separate banner pieces, and I didn’t want to accidentally trim off a part I shouldn’t have. Once the pieces are cut apart, weed the excess iron-on from the liner. The EasyPress 2 in the small size is perfect for small projects like this banner. Since I wasn’t exactly sure what the material of the banner is, I had to test it out a bit. I found that 305° for 30 seconds on the front, plus an additional 15 seconds on the back was perfect. I also had to do a cold peel (where the iron-on is completely cool before peeling off the liner) to be able to get it to adhere to the banner. You can find the recommended settings for the EasyPress here. 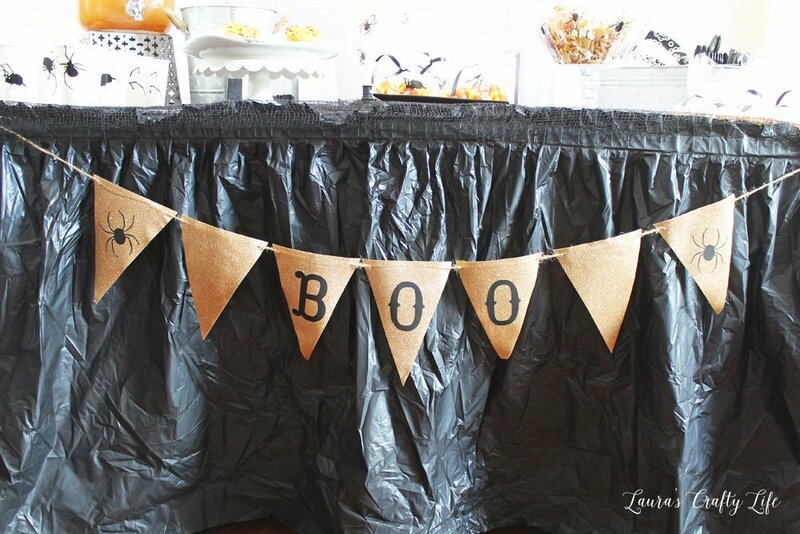 The banner turned out really cute and I will be able to use it in my Halloween decor even after the party. Phew! That was a lot of projects with one machine! 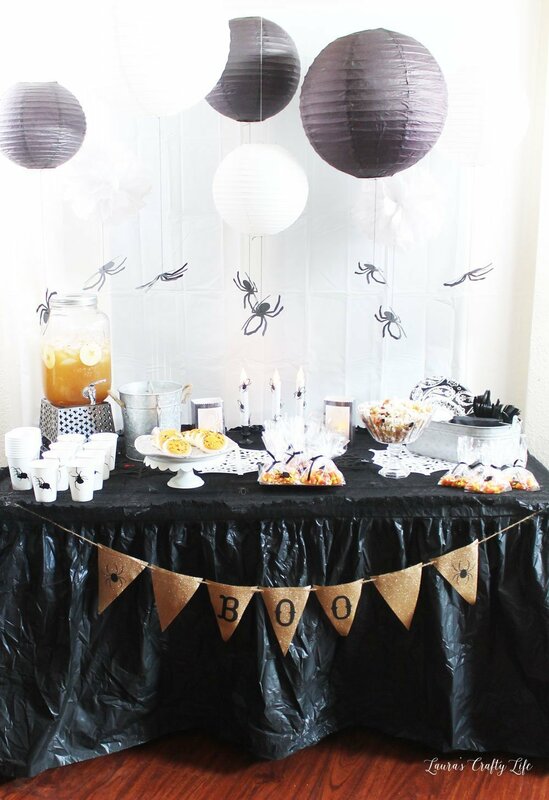 I love how all the details of the party came together to create a cohesive theme. The spiders are a little creepy, but I think for Halloween creepy is just right! And I love that I made almost everything myself. Learn how to create the sparkly spider plate. 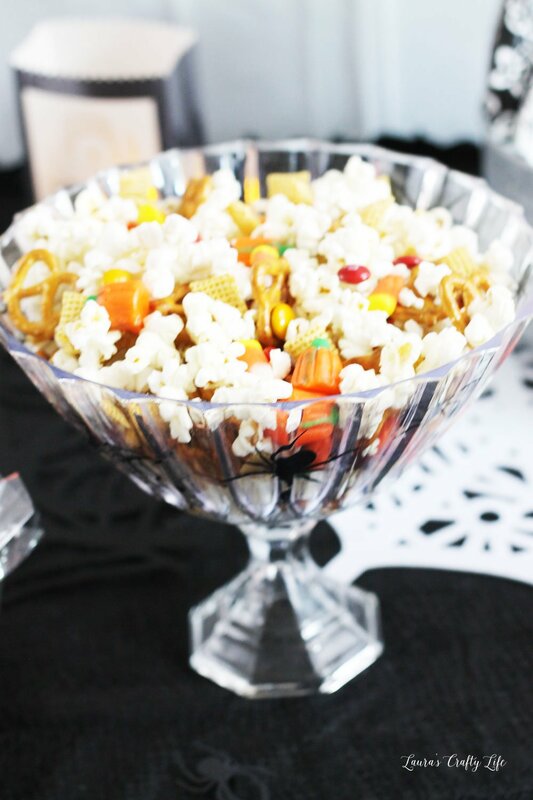 I made my Halloween snack mix and used the spider serving bowl I made (also a Cricut project!). It went perfectly with the theme of the party. I get a lot of questions about whether or not the Cricut machines in particular the Maker are worth it. I think you can see from this post that you can do so many different projects with one machine.